b. 1965 in Maphumulo, KwaZulu Natal. Currently living in Durban. 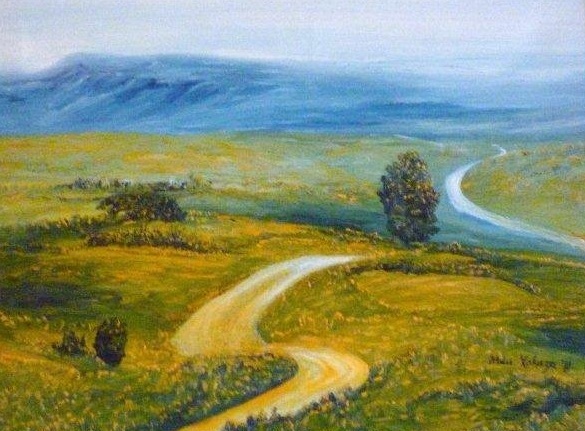 Mzuzile Mduduzi Xakaza’s landscapes draw on personal and collective histories of KwaZulu Natal. His gaze reclaims a land with a troubled history of dispossession, and his craft introduces a dialogue with an established genre in Western art history. Without adopting any overt strategy to mark his work as ‘political’, Xakaza quietly introduces questions of power and agency in contemporary South Africa. 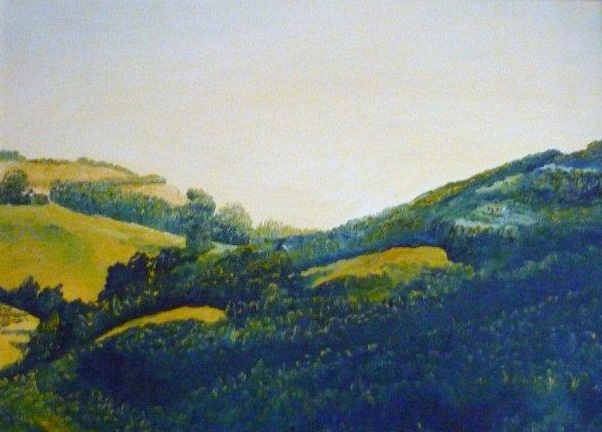 2007: New Landscape paintings. African Art Centre, Durban. 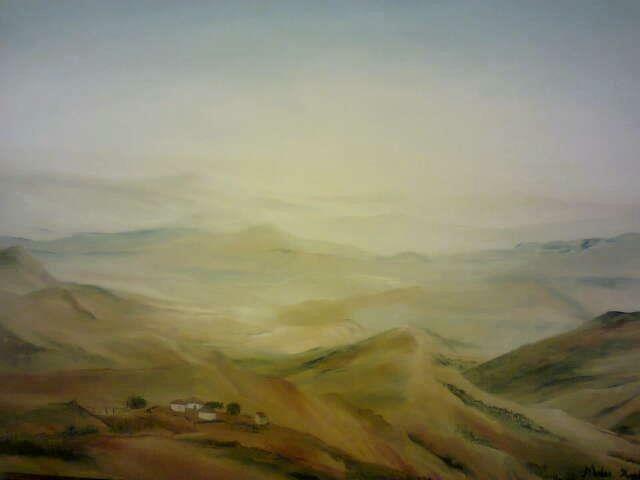 2005: New Landscape paintings.The NSA Gallery, Durban. 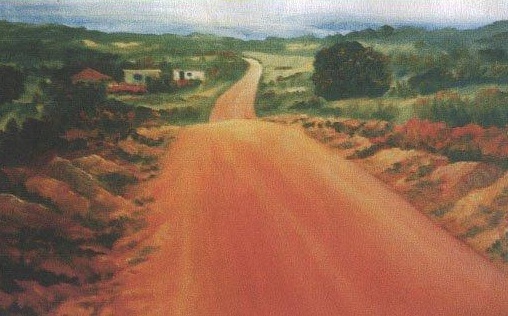 2003: Landscape paintings.African Art Centre, Durban. 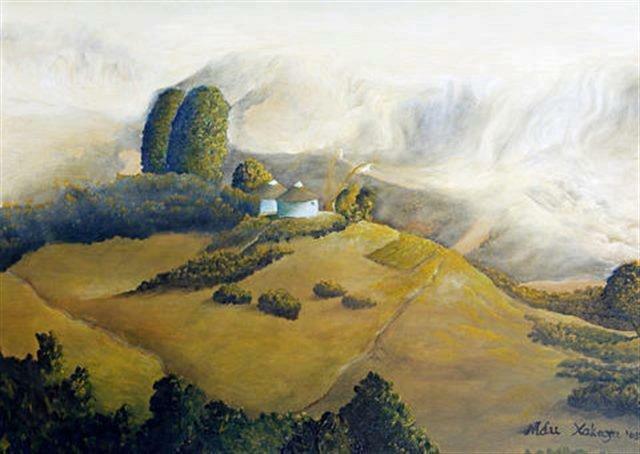 2012: ’View’, KwaZulu-Natal Society of Artists (KZNSA): A group exhibition. 2012: Barbara Lindop at Home, Hyde Park, Johannesburg: A group exhibition curated and hosted by Barbara Lindop. 2011: Barbara Lindop at Home, Hyde Park, Johannesburg: A group exhibition curated and hosted by Barbara Lindop. from South Africa, Mozambique and the United Arab Emirates. the heritage of the city of Durban. 2010: The Lie of the Land group exhibition, Old Town House, Greenmarket Square, Cape Town. Curated by Prof. Michael Godby. 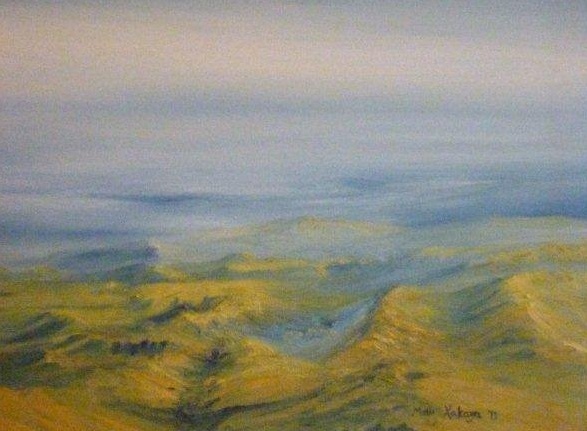 (featured a piece from the permanent collection of the Tatham Art Gallery, Pietermaritzburg). 2009: A group exhibition: Turbine Hall, Johannesburg (curated by Barbara Lindop). 2008: 10th Anniversary Celebrations Exhibition – Greatmore Studios, Woodstock, Cape Town. 2007: Intel Promotional Exhibition, Sandton Square, Sandton, Johannesburg. 2006: Renault Artists@Everard Read: Group exhibition: Everard Read Gallery, Johannesburg. 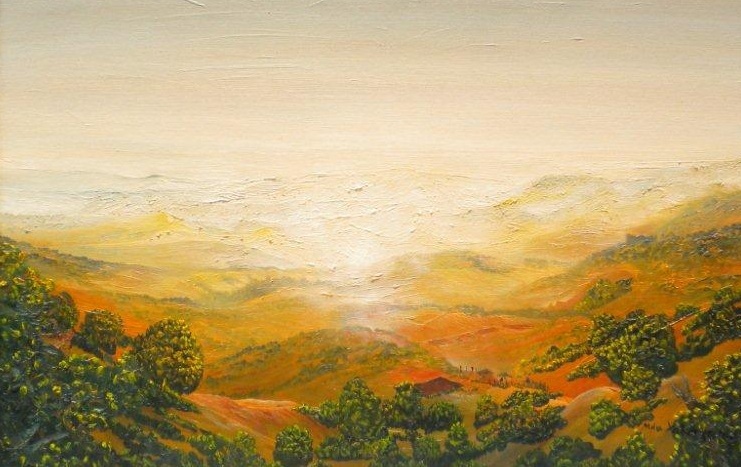 2005: Group exhibition – various artists: Art @ Home: Kloof (near Durban). 2004: ”Summer”, a group exhibition: African Art Centre, Durban. 2004: ”Midlands Biennale 2004: Tatham Art Gallery, Pietermaritzburg. Museum; William Humphrey Art Gallery, Kimberley; Margate Art Gallery, Port Shepstone. 2002: KZN Art teachers’ exhibition: Tatham Art Gallery, Pietermaritzburg. Gallery, Gateway, Durban and MTN, Civic Gallery, Sandton, Johannesburg. 2001: Gordon Verhoef & Krause Art in the Park: Alexandra Park, Pietermaritzburg. 2001: The “Land” exhibition: University of South Africa, Pretoria. Rights Trust: Durban Art Gallery. 2001: ”Break the Silence!” : HIV/AIDS Print Portfolio: BAT Centre, Durban. 2000: Natal Arts Trust Biennale 2000: Tatham Art Gallery, Pietermaritzburg. 2000: ”Yivume Wethu” - A Visual Celebration of the national heritage: NSA Gallery, Durban. Organised and facilitated by Golden Scenario Art Projects. exhibition: Michaelis School of Fine Art, University of Cape Town. 2000: ”Break the Silence!”: HIV/AIDS Print Portfolio: KwaMuhle Museum, Durban. commencing at the Tatham Art Gallery, Pietermaritzburg). Anniversary of the Universal Declaration of Human Rights (UDHR): Durban Art Gallery. 1999: ”Izikhwepha Zethu-Our Strength”: Durban Art Gallery. 1999: ”Ezamandulo”, a Heritage Day exhibition:Durban Art Gallery. 1999: Izwe Lethu - “Our Land”: African Art Centre, Durban. 1999: ”Our Heritage Our Image: The BAT Centre, Durban. 1999: Ngezandla Zethu Art and Crafts Bazaar: Tatham Art Gallery, Pietermaritzburg. 1998: Young Artists’ exhibition: Harris Fine Art,Wynberg, Cape Town. 1997: Metropolitan Life Art exhibition: Tatham Art Gallery, Pietermaritzburg. 1996: Natal Arts Trust 6th Biennale exhibition. Carnegie Art Gallery, Newcastle. 1994: Northern Natal Artists Exhibition: Carnegie Art Gallery, Newcastle. 1994: A group exhibition: NSA Gallery, Durban. 1994-5: ”Artists Invite Artists” exhibition: Durban Art Gallery. 1993: Zululand Society of Arts: Members’Exhibition, Eshowe. 2010: Mr Grahaeme Lindop, Sandton, Johannesburg. 2008: Anette Hoffmann, post-doctoral researcher, University of the Western Cape, Bellville. 2004: Mr Vittorio Meneghelli: Academy Brushware, Germiston. 2002 & 2003: Lima Rural Development Foundation, Pietermaritzburg. Illustration of annual reports. 2000: Pietermaritzburg High Court: A mural project in a children’s Waiting Room. University of Fort Hare, Alice. KwaZulu-Natal Provincial Administration Museum Services, Pietermaritzburg. The Empangeni Art and Cultural History (TEACH) Museum, Empangeni. KwaZulu-Natal Provincial Parliamentary Building, Pietermaritzburg. The Caversham Centre for Artists and Writers, Balgowan. South African Reserve Bank Collection, Pretoria. Iziko South African National Gallery (SANG), Cape Town. Quarters of the Consulate General of the United States of America, Durban. National Arts Council of South Africa, Newtown, Johannesburg. United Nations Office, Geneva, Switzerland. Africa Centre for Health and Population Studies, Hluhluwe. Museum of Modern Art (MoMA), New York City, USA. UCLA Fowler Museum, Los Angeles, USA. Elizabeth Glaser Pediatric AIDS Foundation, Washington D.C., USA. Durban University of Technology Gallery, Durban. Youth Strategy executive, Dumfries and Galloway, Scotland. AMPATH National Laboratory Services, Durban. National Cultural History Museum, Pretoria. Renault South Africa, Sandton, Johannesburg. Offices of the Premier of KwaZulu-Natal province, Pietermaritzburg. MTN Arts Foundation, Johannesburg, South Africa. Greatmore Studios, Woodstock, Cape Town. Also represented in private collections in South Africa and abroad, including those of the former State President of South Africa, Nelson Rolihlahla Mandela, Ms Barbara Lindop of Sandton, Johannesburg, Walter Lindop, Sandton, Johannesburg, former national Minister of Home Affairs, Mangosuthu Buthelezi and former provincial Minister of Arts, Culture, Tourism (KZN), Narend Singh, Patrick and Sally Enthoven, Santa Barbara, U.S.A., and Prof. Extraordinaire, Hans and Mrs Babro Engdahl , Dept of Theology and Religious Studies and School of Government, respectively, University of the Western Cape, Bellville and Peter Neal of the Barton Wine Estate in Botriver, Western Cape. 2009: Andrew W. Mellon Foundation Research Scholarship, University of Minnesota, Minneapolis, U.S.A. This funded my trip to this institution as a visiting research scholar. 2006 - 2008: Andrew W. Mellon Foundation Doctoral Fellowship, USA: Through the Department of History, University of the Western Cape, Bellville. 2013: ‘Natives and ‘other’ Persons may not own so much!’: Power and the construction of the South African landscape before and after 1913, Land Divided Conference, Robert Leslie Social Science Building, University of Cape Town, Rondebosch (in absentia). 2010: Giving Landscape a voice: Photographic dimensions of ‘framing’ power relations in South Africa, Bonani Africa Photographic Festival and Conference, South African Museum, Cape Town. 2009: Power Relations in Santu Mofokeng’s Landscape Photography: A Critical Reflection. Presented at PSHA 4th War and the Everyday Colloquium, Centre for Humanities Research, University of the Western Cape, Bellville. 2009: Reflections on South African Landscape Photography with particular reference to David Goldblatt. Interdisciplinary Center for the study of Global Change (ICGC) Brown Bag seminar, University of Minnesota, Minneapolis, U.S.A.
2008: Land and Human Values: Landscape photographs by David Goldblatt. Presented at PSHA Colloquium, Centre for Humanities Research, University of the Western Cape, Bellville. 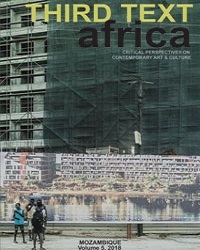 2008: South African Photography: History and concept of landscape. Presented at Post-graduate Seminar, Centre for Humanities Research, University of the Western Cape, Bellville. 2007: Critical Analysis of Landscape photographs by David Goldblatt and Santu Mofokeng. Presented at a Symposium hosted by the Centre for Humanities Research, University of the Western Cape. 2006: Power Relations in Landscape Photographs by David Goldblatt and Santu Mofokeng (an approved research proposal). Presented at a Symposium hosted by the Centre for Humanities Research, University of the Western Cape, Bellville. 2002: Isizathu nokubaluleka komsebenzi wokwenziwa komfanekiso-ngqo weSilo sikaZulu uCetshwayo kaMpande. A promotional talk given to a group of visual artists, Bat Centre, Durban. 2002: The relationship between Culture and Welfare: Some traditional aspects of the concept of Ubuntu. An address at the official launch of the Culture and Counselling Centre, Siyahlomula High School, Ashdown, Pietermaritzburg. 2002: The significance of a prestigious commission for the portrait of King Cetshwayo kaMpande of the Zulu. Heritage Symposium on Arts, Crafts and Culture: Centre for Visual Art, University of Natal, Pietermaritzburg. Organized by the School of Language, Culture and Communication. 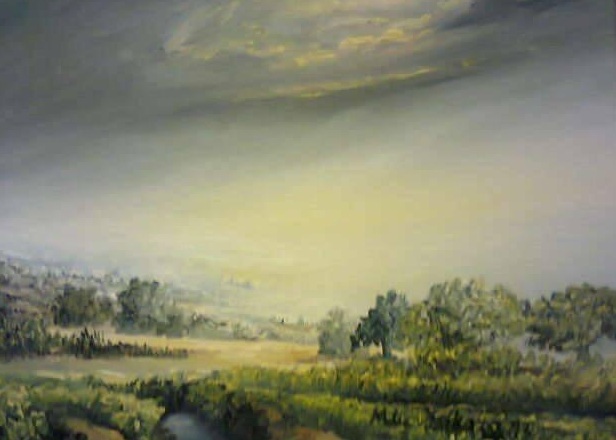 2001: Presented a talk on the historical background and significance of the French art (Barbizon Group and Impressionism) in the permanent collection of the Tatham Art Gallery, Pietermaritzburg. An event held at the Tatham Art Gallery and aimed at promoting public awareness of the French Presence in Pietermaritzburg, coinciding with an anniversary of the death of Prince Imperial, Louis Napoleon, during the Anglo-Zulu War, Isandlwana, 1879. 2001: Witchcraft Images In the Tatham Art Gallery. Regional Conference: South African Museums Association (SAMA): KwaZulu-Natal Branch, Ascot Inn, Pietermaritzburg. 1999: Vuminkosi Zulu: Social and Biblical Themes In His Sculpture and Graphic Work. The 15th Annual Conference of the South African Association of Art Historians (SAAAH), hosted by the Centre for Visual Art, University of Natal, Pietermaritzburg. 1998: “Making a Living”: An Overview of the Ngezandla Zethu Art and Crafts Project. Regional Conference: South African Museums Association (SAMA): KwaZulu-Natal Branch, KwaMuhle Museum, Durban. 1997: Teaching Art to a Black (African) Child of the post-Apartheid South Africa: A Radical Approach. Women Teachers’ Wing of Natal African Teachers Union (NATU): Impendle Community Hall. 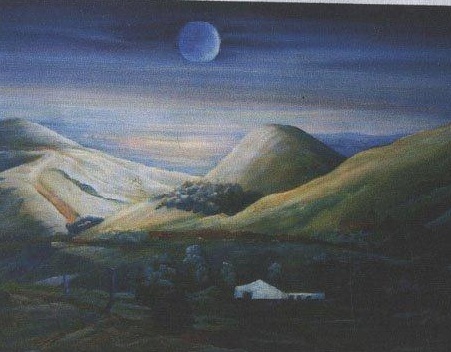 1996: Aspects of Landscape Painting in Northern KwaZulu-Natal. The 12th Annual Conference of the South African Association of Art Historians (SAAAH), Department of Fine Arts and History of Art, University of Natal, Pietermaritzburg. 2011: Guest Speaker at the Awards Presentation Ceremony, Department of Fine Arts and Jewellery Design, Durban University of Technology. 2008: Officially launched the “Hands On! Masks Off!” workshop series: National Arts Festival, Grahamstown. 1996-2006: Weekly art workshops (mainly drawing) for students of various age groups: Tatham Art Gallery, Pietermaritzburg. 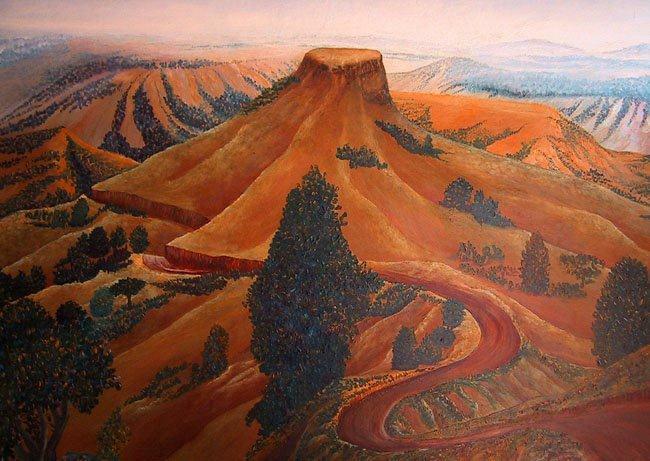 2004: Officially opened an exhibition of landscape paintings by Siyabonga Sikhosana, entitled This is Where We Live, Tatham Art Gallery, Pietermaritzburg. 2001: Stages of Development in Child Art: A lecture offered to local pre-school educators: Organised by the Keep Pietermaritzburg Clean Association (KPCA). 2001: Weekly basic drawing skills workshops: Senzokuhle Women’s Group, Mpophomeni Township, Howick. 2000: Weekly art workshops for children aged between 8 and 16: Ntuthukoville community: Woodlands, Pietermaritzburg. 1999 - 2000: Umthangala art appreciation classes: A series of visual literacy workshops for Pietermaritzburg and greater iNdlovu Region township and rural crafters. 1999: Indima emelwe ukudlalwa nguthisha ongum-Afrika wangekhulunyaka lamashumi amabili nanye: Ukudlinza okuyinjulabuchopho. A thanks-giving party in respect of an academic achievement made by Xolisile Felicitus Buselaphi Makhaye: Orients Heights, Pietermaritzburg. 1999: Children’s holiday workshop: Paper collage: Tatham Art Gallery, Pietermaritzburg. 1999 - 2000: Bi-weekly art workshops for children aged between 8 and 15: Ntuthukoville community: Woodlands, Pietermaritzburg. 1999: Mural project for Ntuthukoville Community Hall: Children from Ntuthukoville community: Woodlands, Pietermaritzburg. 1997 - 1998: Children’s Holiday Workshops: Various art skills: Georgetown Library, Edendale, Pietermaritzburg. 1997 - 1998: Weekly art workshops for children: SOS Children’s Village: Grange Village, Pietermaritzburg. 1996 - 1997: Weekly art workshops for inmates: New Pietermaritzburg Prison. 2013: Member of judging panel, ABSA L’Atelier Art Competition, KZN region, ArtSpace Gallery, off Umgeni Road, Durban. 2011: Board member of Artists for Humanity (AFH), Fine Arts Department, Durban University of Technology. 2008: Member of Selection Panel: Nelson Mandela Metropolitan Art Museum Award 2008. Nelson Mandela Metropolitan Art Museum, Port Elizabeth. 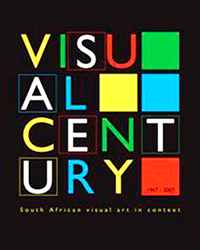 2007-2010: Chairperson: Visual Art Advisory Panel – National Arts Council of South Africa. 2007-2010: Member of Multi-Disciplinary Advisory Panel – National Arts Council of South Africa. 2006 – 10: Appointed as member of the new Board of the National Arts Council of South Africa. 1999-2006: Member of Board of Trustees: The Vuminkosi Zulu Family Trust, Pietermaritzburg. 1999-2006: Member of Exhibitions Committee (non-voting): Tatham Art Gallery, Pietermaritzburg. 2005: Member of judging panel (with Minister Ina Cronje and Val Maggs) for an art competition for the provincial schools art competition, called “Getting KwaZulu-Natal Learning”: Department of Education, Pietermaritzburg. 2005: Member of the Msunduzi Arts and Culture Council Forum, Pietermaritzburg. 2005-2006: Independent Municipal and Allied Trade Union (IMATU) Shop Steward, Msunduzi Municipality. 2002: Member of selection panel: Gordon Verhoef & Krause Art in the Park: Tourism Authority, Pietermaritzburg. 2002: Member of selection panel: Environmental awareness children’s art competition: Organised by the Pietermaritzburg Tourism Authority: Golden Horse Casino, Pietermaritzburg. 2002: Member of judging panel: KwaZulu-Natal prisons visual art competition: Organised by NICRO, KZN. 2002: Judged art competition for the Natal Museum’s Sabalala Nolwazi Youth Project, Pietermaritzburg. National heritage celebration. 1999-2001: Member, Management Board of Jambo Arts Centre, Pietermaritzburg. 1999-2001: Chairman, Executive Committee of Golden Scenario Art Projects, Pietermaritzburg and KwaZulu-Natal Midlands. 1999-2000: Secretary, Pietermaritzburg regional committee of the KwaZulu-Natal Art and Crafts Council. 1999: Member of judging panel: Mural paintings competition, Sobantu Creche and Pre-school, Pietermaritzburg. 1999: Member of judging panel: The 50th Anniversary Children’s Competition (SOS-KDI Region of Southern Africa II), SOS Children’s Village, Pietermaritzburg. 1999: Member of judging panel: Children’s art competition for Children’s Day, Keep Pietermaritzburg Clean Association, Pietermaritzburg. 1998: Member of judging panel: Crafts Council Fair 1998 (organised and facilitated by the National Crafts Council of South Africa - KwaZulu-Natal Branch), Durban Exhibition Centre. 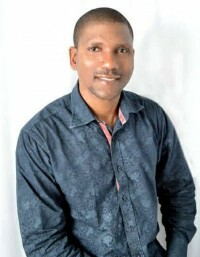 1997-9: Founder member and Projects Co-ordinator of Golden Scenario Art Projects, Pietermaritzburg and KwaZulu-Natal Midlands (Launched on 26 August 1997 at the Tatham Art Gallery). 1997-9: Member of Selection Committee for Gordon Verhoef & Krause Art in the Park, Publicity Association, Pietermaritzburg. 1996-8: Chairman, KwaZulu-Natal Midlands sub-committee of the Craft Council of South Africa, called Craft Action Body. 1997: Judged children’s art competition for World Environmental Day, Ambleton Community Primary School, Mpumelelo Village, Pietermaritzburg. 1996: Member of selection panel for “Jabulisa: The Art of KwaZulu-Natal” Art Exhibition (first held at the national arts festival, Grahamstown in July, 1996). Selection at the Carnegie Art Museum. 1994-6: Member of Acquisitions Committee, Carnegie Art Gallery, Newcastle. 1991: Treasurer of Fine Arts Society (FASOC), Department of Fine Arts, University of Fort Hare, Alice. 2010: Induction Workshop for newly appointed Academic Staff: Vaal University of Technology, Vanderbijlpark. 2002: Symposium on heritage in Pietermaritzburg, entitled “Dead or alive?” Colin Webb Hall, University of Natal, Pietermaritzburg. 2001: “Changes in emphasis in UK museums from collection based work, to learning, access and combating social exclusion”: A seminar paper delivered by Mark Taylor: KwaMuhle Museum, Durban. Organized by the South African Museums Association (SAMA). 2001: Indigenous Knowledge Workshop: Seminar Room 1, Technikon Natal, Durban. 2000: A follow-up workshop on outcomes-based education - Voortrekker, Tatham and Natal museums, Pietermaritzburg: Conducted by teams from the three museums. 1999: A printmaking workshop - lithography and screen printing: The Caversham Press, Balgowan. 1999: A workshop on outcomes-based education: KwaMuhle Museum, Durban. Organised by the South African Museums Association (SAMA) and facilitated by Darryl Houghton of the Department of Education (KwaZulu-Natal province). 1999: An open-air visual art workshop: Tatham Art Gallery premises, Pietermaritzburg. An untutored workshop organized by the Golden Scenario Art Projects. 1998: Potato printing workshop - fabric workshop: Old Presbyterian Church, Tatham Art Gallery, Pietermaritzburg. 1997: A printmaking workshop - screen printing, lithography, lino cutting and etching: The Caversham Press, Balgowan. 2013: Compiled a catalogue essay entitled Who occupies the “centre”? 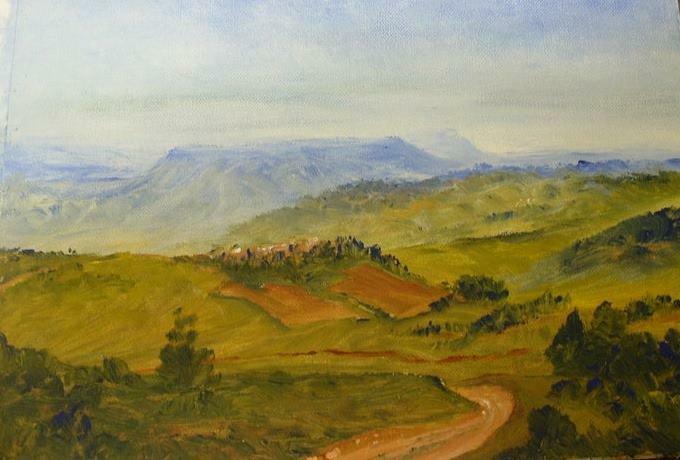 : Reflections on power relations in Gerard Sekoto’s landscapes and other approaches to landscape painting (for Song for Sekoto posthumous exhibition of works by Gerard Sekoto, Wits Art Museum, Johannesburg, 25 April 2013). 2004: Compiled a catalogue essay entitled Vuminkosi Zulu: A Critical Analysis of Social and Biblical Themes in his Art (for a traveling exhibition called Veterans of KwaZulu-Natal) – curated by Jill Addleson of the Durban Art Gallery. 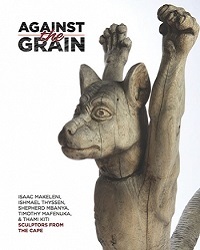 2004: Compiled a catalogue essay entitled Social, political and cultural aspects of the art of Trevor Makhoba in the collection of the Tatham Art Gallery: A critical analysis and assessment (for a failed posthumous exhibition of work by Trevor Makhoba) – curated by Jill Addleson of the Durban Art Gallery. 2002: Compiled an essay entitled Spiritual Connotations of Magic/Witchcraft: A biblical perspective (for a nationally travelling exhibition called Untold tales of magic: Abelumbi) – curated by Jill Addleson of the Durban Art Gallery. 2000: Had a screenprint, “Yehoshua comforting an AIDS victim” presented to the former State President of South Africa, Nelson Rolihlahla Mandela, by the Artists For Human Rights Trust Committee: Technikon Natal, Durban: 11th October. The print was an Artist’s Proof (A/P) of an edition for the Human Rights Portfolio exhibition, called “Break the Silence”. 2000: Organised and co-curated the “Yivume Wethu” group exhibition: N.S.A. Gallery, Durban: 3 - 21 September. 2000: Compiled media releases on the “Yivume Wethu” group exhibition (a visual celebration of the national heritage): N.S.A. Gallery, Durban. 1999/2000: Compiled media articles on Golden Scenario 2000!!! : Menzi Mchunu and Democratic galleries, BAT Centre, Durban Harbour. 1999: Organised and co-curated Golden Scenario 2000!! !, a group exhibition presented by the Golden Scenario Art Projects: Menzi Mchunu Gallery, BAT Centre Trust, Durban Harbour. 1999: Designed a logo for the Isizinda samaDeke, an organisation aimed at maintaining solidarity among the Makhaye clan. 1999: Compiled the first issue of the Golden Scenario Art Projects newsletter: April-June issue. 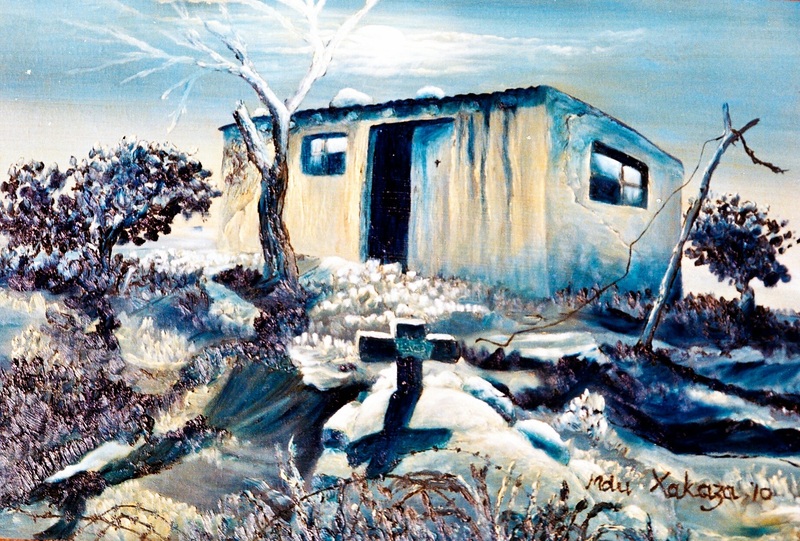 1999: Illustrated the cover of “Fidelities V”, a publication of a collection of poetry of Pietermaritzburg. 1998: Compiled a text for the travelling Vuminkosi Zulu Retrospective Exhibition catalogue, initially featured in the Standard Bank National Arts Festival, 1998, Grahamstown. 1998: Co-ordinated the “Inhlabamkhosi-The Clarion Call” art exhibition, held at the Empangeni Art and Cultural History Museum, Empangeni. 1997: Compiled the Metropolitan Life Art exhibition catalogue. 1997: Co-ordinated the Metropolitan Life Art exhibition, Tatham Art Gallery, Pietermaritzburg. 1997: Designed the first Golden Scenario Art Projects logo. 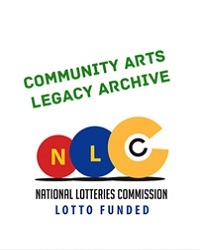 1996: Co-pioneered the formation of the now defunct Golden Scenario Art Projects, an artists’ organisation, launched in 1997 at the Tatham Art Gallery, Pietermaritzburg.